You’ve had a little too much Ouzo in Mykonos and your skin’s a little burnt from sun-bathing in Santorini, but truth be told, you are not ready to leave the Greek Islands just yet. The mainstream islands are great but really, it is the secret islands that only locals know about, that really represents the best of Greece. Luckily for you, WanderLuxe has ‘insider’ knowledge to share. You have probably not heard of these islands that are off the radar, but trust us, once you have seen these gems, you will never go back mainstream. How to get here? You can take a flight from Athens or a ferry from Piraeus, Santorini or Paros. Do look for the information here. If there was one famous Greek statue you need to know about, it is the statue of Venus de Milo. It is a marble statue believed to be Aphrodite, most importantly depicted with the mystery of her missing arms. You would have guessed it, this statue was found by a pheasant on the islands of Milo, hence the name. Fear not, apart from a rich Greek history, the Greek Island of Milos do have a lot of other attractions such as hot springs and at least eighty or more beaches with white, black, red, and grey sand to sunbathe on. How to get here: Catch a ferry from Athens or take a ferry or flight from Rhodes. 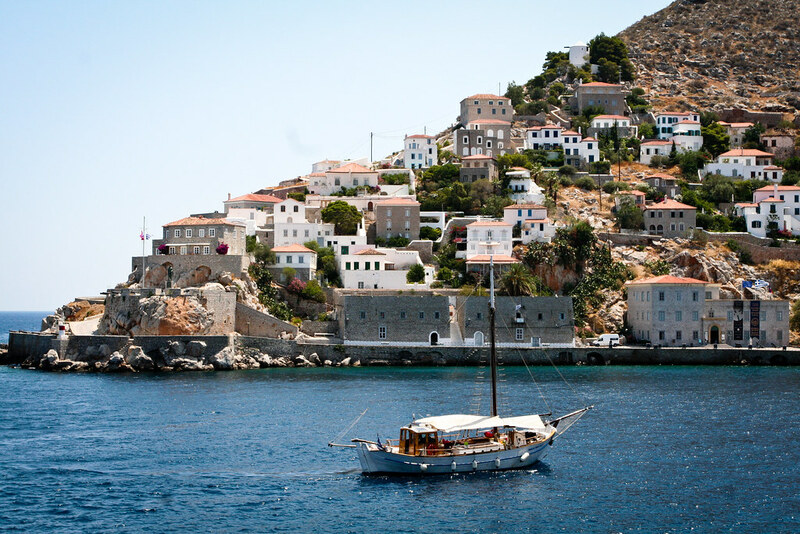 Kastellorizo, or also known as “Megisti” is only half a mile away from the Turkish coast. This island boasts one of the best architecture, mixing Turkish and Greek influence in its buildings and culture. Start your trip by spending the day venturing around the ancient village of Palaiokastro and check out the Doric acropolis that dates back to the 3rd century B.C. The highlight would definitely be swimming around the underwater caves like The Blue Cave or Cave of Parastas. How to get here: It is a rather long-winded journey to get to this island, but that is how you know it will be worth it! There are no direct ferries from Athens, therefore, you will need to catch a ferry from these other islands first: Volos, Skiathos island, Skopelos island (Glossa and Town), Kymi, Skyros island or Agios Constantinos. From there, you will need to take a connecting ferry (or these other options) to get to Alonissos. How far would you travel to be surrounded by a designated marine park home to seals and dolphins? With waters that are crystal clear and seabed ideal for diving, Alonissos is the dream for any traveller that loves the outdoors. Whilst here, do also check out the indigenous herbs that come from the island’s rich landscape! How to get here: Spetses does not have an airport so the only way to get here is by sea. To take a ferry from Athens, find out more here. Spetses was one of the glitziest spots to vacation at in the 1960s where big stars such as Marilyn Monroe and Elizabeth Taylor spent their summer. Till this day, it manages to retain its ‘wow’ factor with luxurious hotels, yachts and villas. Don’t be mistaken by all its fancy for Spetses has not lost its natural charm — cars are still banned and you will continue to see horse-drawn carriages in the city! How to get here: From Athens, take a taxi or bus to the port of Piraues and then a ferry to Hydra. Click here for more details on transfers. Winding streets are lined with 18th-century mansions, museums, art galleries and churches. Indeed, time seems to stand still on this island where cars and motorcycles aren’t a common sight, but donkeys are. If you’re dreaming of Greecian cobblestone architecture, glistening waters and even following in the footsteps of celebrities like Leonard Cohen and Sophia Loren, Hydra is just perfect for a traveller like you.